Exactly a week ago, I was stressing about not being able to feel any movement and now, seven days later, the movements hardly stop! It’s a very strange sensation, as I remarked in my 21 week diary entry (which, by the way, I only wrote a few days ago, so please forgive any repetitiveness), but a wonderful one. 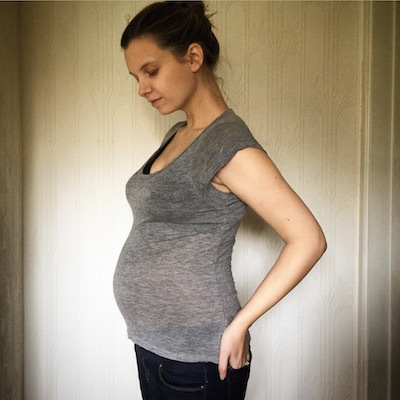 Early pregnancy is such an odd, anxious time; there’s no real sign that there’s anything growing away inside you, apart from the tiredness and sickness and general feeling of malaise. Having a tummy that’s bubbling away with little somersaults and kicks is kind of like getting a reassuring pat that everything’s okay. By week seventeen, I was starting to regain my appetite (must have been around Christmastime) and for the last month or so, I’ve been re-introducing all of the foods I had missed. Spicy curry (homemade, healthy), beautiful fresh seafood, stir-fries and salads, cooked breakfasts, bagels… But since the middle of last week queasiness has set in once more – only sporadically, and it’s actually only when I think about it, so it could be psychosomatic, but still. Eugh. I wonder if it’s a common thing? A spot of secret and illegal pregnancy Googling (I have been banned) brought up quite a few forum threads with people complaining of returned morning sickness, but I didn’t want to click in case a klaxon might start blaring and all of the house lights flash on and off, signalling my research rule-breaking. Today I’m going to attempt a baby bump picture, so I’ll add it in above if I manage to take a good one. The intention was always that I would do one on the same day of the week, every week, but here we are at Week 22 and no bump progress pictures whatsoever. It doesn’t help that I need someone to take them, and my dear husband has had some kind of weird phobia about doing them. Now he has agreed, but wants to set up proper lighting and a background and all of that jazz – I JUST WANT A PICTURE OF MY BUMP AGAINST A WHITE WALL! In other news, I have started setting my husband little tasks in preparation for the baby arriving; things he can enjoy doing and be good at. This week: researching baby car seats and prams. Here’s his first suggestion: the Camo Pram. PS: if you read Belly Button Watch and were wondering about progress: it still hasn’t popped outwards. It’s very flat, with a little fold, but no pop. I continue to observe religiously whenever work commitments allow.